Washington, DC –– Before the start of a Senate Armed Services Committee hearing about Afghanistan, Dr. Margaret Flowers was arrested for speaking out against the recent US bombing of a Doctors Without Border hospital in Kunduz, Afghanistan. Dr. Flowers was holding a sign which read “BOMBING HOSPITALS= WAR CRIME”. In the attack on Kunduz, twelve staff members and at least seven patients, including three children, were killed; 37 people were injured, including 19 staff members. Dr. 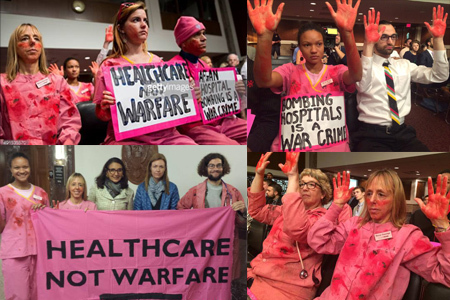 Flowers, a pediatrician from the Washington DC-based activist group Popular Resistance, was with members of the peace group CODEPINK at the hearing who were wearing “bloodied” doctors garb with “bloody” hands to draw attention to the culpability of the US military for the hospital bombing, and specifically the culpability of hearing witness General John Campbell, who is responsible for US forces in Afghanistan. “There needs to be an independent investigation into the hospital bombing in Kunduz because targeting hospitals is against international law,” Dr. Flowers said from the Capitol Hill jail. “People should be held accountable for violating the law.” Flowers is also a candidate for the US Senate seeking Sen. Barbara Mikulski’s seat. The protesters are also calling for a US commitment to rebuild the hospital, provide health care for the injured parties and compensate the families of the deceased. They delivered to General Campbell a petition to that effect signed by over 5,000 members of CODEPINK. Several members of Doctors Without Borders attended the hearing. "Only an independent investigation will give us answers as to why a hospital was bombed and why the bombing continued for more than 30 minutes after Coalition and Afghan forces were informed that they were bombing a humanitarian hospital. The 22 civilians killed in this attack, including 12 staff of Doctors Without Borders deserve a transparent investigation," said Ella Watson-Stryker, who was named Time magazine person of the year for fighting Ebola with Doctors Without Borders. "I feel like one part of me, my government to which I pay taxes, has bombed the other part of me, my vocation as a humanitarian worker," says Athena Viscusi, a social worker who has worked with Doctors Without Borders delivering mental health care. "Accusations that Doctors Without Borders was harboring Taliban fighters are offensive and impossible. I echo the call for an independent investigation."